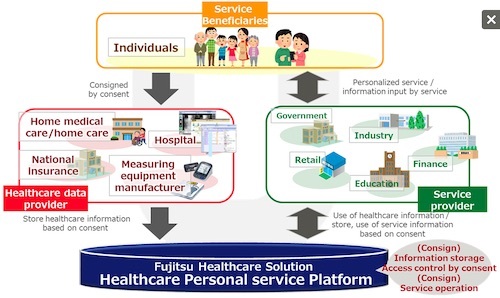 TOKYO, Feb, 13 2019 - (JCN Newswire) - Fujitsu has announced the development of Fujitsu Healthcare Solution Healthcare Personal service Platform, a platform-as-a-service (PaaS) for the integrated management of consumer-facing offerings based on health and medical information. The new service can aggregate and integrate an individual's personal health record(1), enabling the safe and secure storage and use of such health and medical information. Healthcare Personal service Platform is available beginning today.